7 The territory of Manasseh reached from Asher to Michmethath, which is east of Shechem. Then the boundary goes along southward to the inhabitants of En-tappuah. 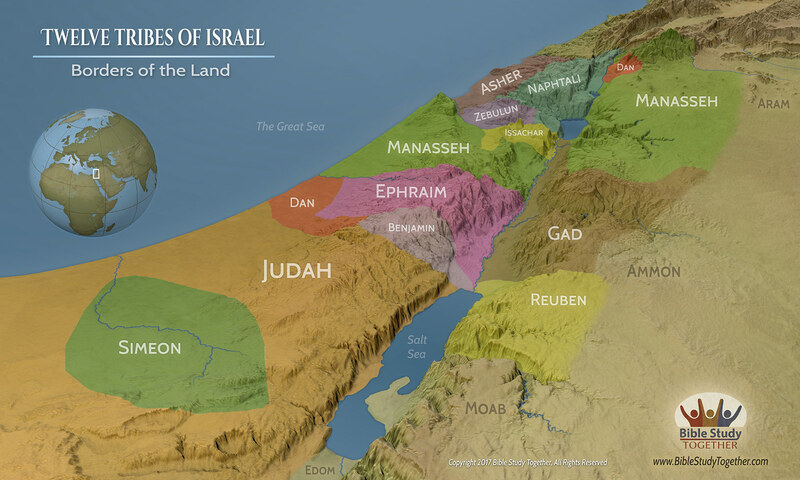 8 The land of Tappuah belonged to Manasseh, but the town of Tappuah on the boundary of Manasseh belonged to the people of Ephraim. 9 Then the boundary went down to the brook Kanah. These cities, to the south of the brook, among the cities of Manasseh, belong to Ephraim. Then the boundary of Manasseh goes on the north side of the brook and ends at the sea, 10 the land to the south being Ephraim's and that to the north being Manasseh's, with the sea forming its boundary. On the north Asher is reached, and on the east Issachar. 11 Also in Issachar and in Asher Manasseh had Beth-shean and its villages, and Ibleam and its villages, and the inhabitants of Dor and its villages, and the inhabitants of En-dor and its villages, and the inhabitants of Taanach and its villages, and the inhabitants of Megiddo and its villages; the third is Naphath. 12 Yet the people of Manasseh could not take possession of those cities, but the Canaanites persisted in dwelling in that land. 13 Now when the people of Israel grew strong, they put the Canaanites to forced labor, but did not utterly drive them out. 16:1And the lot of the children of Joseph fell from Jordan by Jericho, unto the water of Jericho on the east, to the wilderness that goeth up from Jericho throughout mount Bethel. 16:2And goeth out from Bethel to Luz, and passeth along unto the borders of Archi to Ataroth, 16:3And goeth down westward to the coast of Japhleti, unto the coast of Bethhoron the nether, and to Gezer: and the goings out thereof are at the sea. 16:4So the children of Joseph, Manasseh and Ephraim, took their inheritance. 16:5And the border of the children of Ephraim according to their families was thus: even the border of their inheritance on the east side was Atarothaddar, unto Bethhoron the upper; 16:6And the border went out toward the sea to Michmethah on the north side; and the border went about eastward unto Taanathshiloh, and passed by it on the east to Janohah; 16:7And it went down from Janohah to Ataroth, and to Naarath, and came to Jericho, and went out at Jordan. 16:8The border went out from Tappuah westward unto the river Kanah; and the goings out thereof were at the sea. This is the inheritance of the tribe of the children of Ephraim by their families. 16:9And the separate cities for the children of Ephraim were among the inheritance of the children of Manasseh, all the cities with their villages. 16:10And they drave not out the Canaanites that dwelt in Gezer: but the Canaanites dwell among the Ephraimites unto this day, and serve under tribute. 17:1There was also a lot for the tribe of Manasseh; for he was the firstborn of Joseph; to wit, for Machir the firstborn of Manasseh, the father of Gilead: because he was a man of war, therefore he had Gilead and Bashan.17:2There was also a lot for the rest of the children of Manasseh by their families; for the children of Abiezer, and for the children of Helek, and for the children of Asriel, and for the children of Shechem, and for the children of Hepher, and for the children of Shemida: these were the male children of Manasseh the son of Joseph by their families.17:3But Zelophehad, the son of Hepher, the son of Gilead, the son of Machir, the son of Manasseh, had no sons, but daughters: and these are the names of his daughters, Mahlah, and Noah, Hoglah, Milcah, and Tirzah.17:4And they came near before Eleazar the priest, and before Joshua the son of Nun, and before the princes, saying, The LORD commanded Moses to give us an inheritance among our brethren. Therefore according to the commandment of the LORD he gave them an inheritance among the brethren of their father.17:5And there fell ten portions to Manasseh, beside the land of Gilead and Bashan, which were on the other side Jordan;17:6Because the daughters of Manasseh had an inheritance among his sons: and the rest of Manasseh's sons had the land of Gilead.17:7And the coast of Manasseh was from Asher to Michmethah, that lieth before Shechem; and the border went along on the right hand unto the inhabitants of Entappuah.17:8Now Manasseh had the land of Tappuah: but Tappuah on the border of Manasseh belonged to the children of Ephraim;17:9And the coast descended unto the river Kanah, southward of the river: these cities of Ephraim are among the cities of Manasseh: the coast of Manasseh also was on the north side of the river, and the outgoings of it were at the sea:17:10Southward it was Ephraim's, and northward it was Manasseh's, and the sea is his border; and they met together in Asher on the north, and in Issachar on the east.17:11And Manasseh had in Issachar and in Asher Bethshean and her towns, and Ibleam and her towns, and the inhabitants of Dor and her towns, and the inhabitants of Endor and her towns, and the inhabitants of Taanach and her towns, and the inhabitants of Megiddo and her towns, even three countries.17:12Yet the children of Manasseh could not drive out the inhabitants of those cities; but the Canaanites would dwell in that land.17:13Yet it came to pass, when the children of Israel were waxen strong, that they put the Canaanites to tribute; but did not utterly drive them out.17:14And the children of Joseph spake unto Joshua, saying, Why hast thou given me but one lot and one portion to inherit, seeing I am a great people, forasmuch as the LORD hath blessed me hitherto?17:15And Joshua answered them, If thou be a great people, then get thee up to the wood country, and cut down for thyself there in the land of the Perizzites and of the giants, if mount Ephraim be too narrow for thee.17:16And the children of Joseph said, The hill is not enough for us: and all the Canaanites that dwell in the land of the valley have chariots of iron, both they who are of Bethshean and her towns, and they who are of the valley of Jezreel.17:17And Joshua spake unto the house of Joseph, even to Ephraim and to Manasseh, saying, Thou art a great people, and hast great power: thou shalt not have one lot only:17:18But the mountain shall be thine; for it is a wood, and thou shalt cut it down: and the outgoings of it shall be thine: for thou shalt drive out the Canaanites, though they have iron chariots, and though they be strong. 24And when they were come to Capernaum, they that received tribute money came to Peter, and said, Doth not your master pay tribute?25He saith, Yes. And when he was come into the house, Jesus prevented him, saying, What thinkest thou, Simon? of whom do the kings of the earth take custom or tribute? of their own children, or of strangers?26Peter saith unto him, Of strangers. Jesus saith unto him, Then are the children free.27Notwithstanding, lest we should offend them, go thou to the sea, and cast an hook, and take up the fish that first cometh up; and when thou hast opened his mouth, thou shalt find a piece of money: that take, and give unto them for me and thee. 33And he came to Capernaum: and being in the house he asked them, What was it that ye disputed among yourselves by the way?34But they held their peace: for by the way they had disputed among themselves, who should be the greatest.35And he sat down, and called the twelve, and saith unto them, If any man desire to be first, the same shall be last of all, and servant of all.36And he took a child, and set him in the midst of them: and when he had taken him in his arms, he said unto them,37Whosoever shall receive one of such children in my name, receiveth me: and whosoever shall receive me, receiveth not me, but him that sent me. How do we make excuses about driving sin out of our lives in the same way that the Ephraimites made excuses about driving out the Canaanites from their inheritance? How did Jesus seek to walk peaceably among those who did not understand who He was? Why did Jesus say it’s valuable to receive even the least important people in His name? Who is God calling you to receive? Receive someone in Jesus name.